Alfalfa weevil is a pest associated with the first cutting.The first cut for alfalfa has been well underway in west central and northwest Minnesota for the past week. Alfalfa looks very good as the cool weather allowed for significant vegetative growth. Growth stage in the region is late bud to early flower. The weevil, though, are developing at their own rate, a rate affected by temperatures. As growers begin cutting, they need to be aware of the presence or abscence of Alfalfa weevil larvae in their fields. Field observations are finding young larvae, first and second instars (1/4 inch or less in size), just beginning to feed in the plant terminals. If a grower looks closely, they should be able to see the characteristic shot-holing of leaves in the terminal. Sampling these plants by shaking them into a small bucket will reveal the young, pale green larvae. We have also heard a comment regarding "seeing all these worms on the cutting bar." Now, this is not a sampling strategy for making decisions, but it should be a wake up call to scout the field closely and decide if anything needs to be done to protect the regrowth. The fields we have looked at are better off being cut at his time and decisions on alfalfa weevil management being made on the regrowth. After cutting infested alfalfa, be sure to scout after cutting to determine weevil survival and monitor regrowth for stubble infestation, particularly beneath windrows, and look for any larval feeding. After the hay has been picked up, sample the stubble and early regrowth in 20 one square foot samples, 4 chosen randomly from 5 locations. Eight or more larvae per square foot has been used in the past as a treatment threshold. The failure of a field to "green up" after 7 to 10 days with adequate moisture is a sign that stubble treatment is needed. Insecticides labeled for alfalfa weevil include Baythroid*, carbaryl (Sevin), chlorpyrifos* (Lorsban and generics) and its mixtures, cyfluthrin* (Tombstone), Imidan, lambda-cyhalothrin* (Warrior formulations and generics), Lannate*, malathion, methyl parathion*, Mustang*, permethrin* (Ambush, Artic, Pounce, and others), and Proaxis*, Steward. Degree Day (DD) models for insects, diseases, and plants recognize the dependence on heat in their environment to drive metabolic processes since they cannot generate their own heat as do warm- blooded animals. The heat drives metabolic processes, affecting growth and developmental rate. The amount of heat available to drive an organism's growth and development can be measured by temperature which is a measure of heat in the organism's environment. Researchers have been able to establish mathematical equations that predict the rate of development at different temperatures. These relationships can be used to predict the rate of an insect or plant's development as temperatures fluctuate over time. A degree day is simply a measure or index of the amount of heat accumulated during a day to drive the metabolism or development of a cold blooded organism. 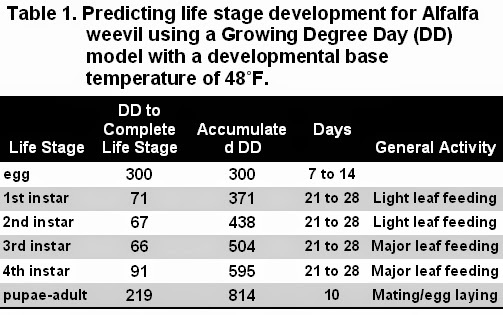 The DD model for alfalfa weevil uses a base temperature of 48°F, the lowest temperature where weevils can develop (Table 1). The primary use of DD in IPM is to time scouting for pest species. By using DD we can eliminate unnecessary scouting, we can avoid missing injurious pest populations, and we can make better management decisions. These techniques help prevent economic losses and excess use of pesticides. 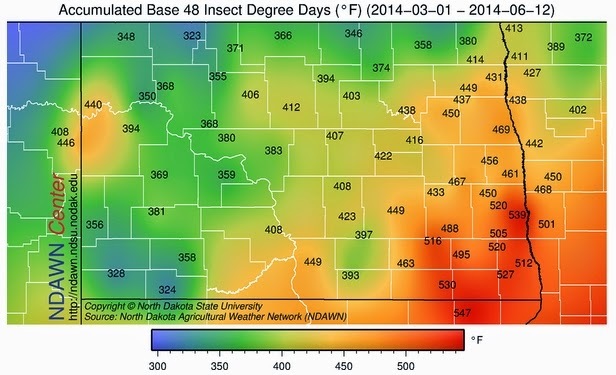 Where are we for Alfalfa Weevil Degree Days? Currently, weather records from stations in WC and NW MN indicate that DD accumulations are are approaching 500 DD in the southern and 400 DD in the northern areas. Based on the model in Table 1 we are shifting to 3rd instar larvae and major feeding should be getting underway. The 500 DD accumulation is a Critical scouting time for alfalfa weevil. 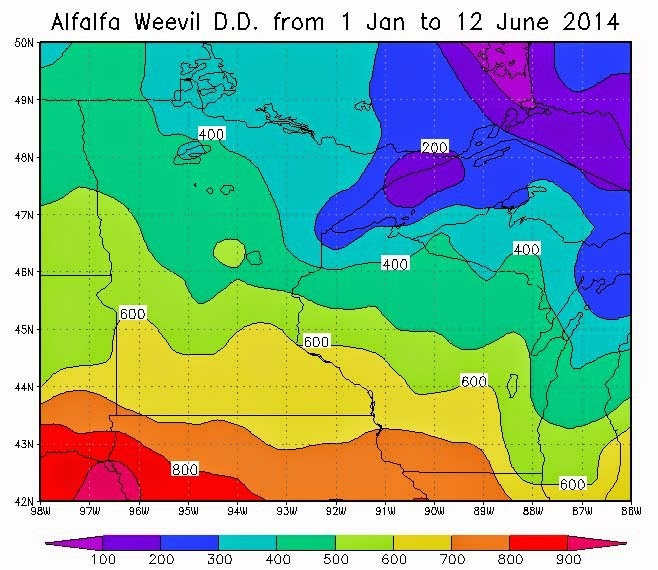 To stay current on degree day accumulations for alfalfa weevil, there are two useful web sites that will help. The first is the NDAWN weather system that is maintained through NDSU. The second is the generalized map for Alfalfa Weevil posted by University of Wisconsin Extension which automatically updates daily.